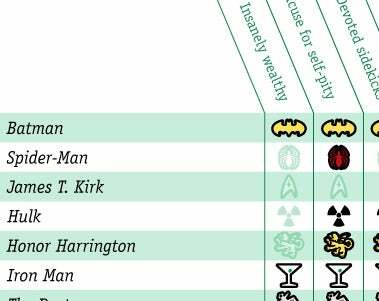 How Does Your Hero Measure Up On Our Wish-Fulfillment Checklist? Sometimes you just want to escape into a heroic universe of wish fulfillment, with just the right kind of angst. And let's face it, some heroes do a better job of hitting your escapism sweet spots than others. We've put together a chart comparing the great action heroes, and seeing which ones hit most of the sweet spots of escapism. The categories in the chart should be pretty self-explanatory. But here's some explanation anyway: We love our heroes to be super rich, and to have an excuse for self-pity. If your fabulously wealthy parents got killed in front of you when you're a kid, so much the better. (Seriously, a tragic past seems to be a crucial ingredient for many escapist heroes, because it lets you project all your own real-life pain onto your hero, even as you're imagining rising about that pain and becoming a mega-adventurer. ) And it makes us happy when our heroes have two or more devoted acolytes/sidekicks, who follow almost without question, and awesome gadgets. Superhuman powers means what it says. "Gets laid" doesn't just mean your hero hooked up one time. "Marked for greatness" requires slightly more explanation. If your hero is the subject of a prophecy (like Starbuck), or is "the One" like Neo, then he/she is marked for greatness. Captain Kirk wasn't marked for greatness on the original Star Trek TV show, but we have a strong suspicion that the new Trek movie, by revisiting his origins, will show that he was marked for great things from the beginning. "Not tied down" doesn't just mean being single: it means that you get to roam around having adventures. And at the end of an adventure, you jump in your spaceship and zoom off to the next adventure somewhere else. Captain Kirk wasn't tied down, but Captain Sisko was. "Becomes a god or king" means your character ends up with a lot of people looking up to him/her. The Hulk, for example, is destined either to become a ruler, the Maestro, or the last survivor of Earth. Captain Kirk becomes an admiral, but more importantly he becomes a legend in his own time. The Doctor becomes the last of the Time Lords, and gets called a god a lot. Neo turns into the blind buddha Jesus monster, or something.